Since the release of our full packed e-commerce featured Blogger Blogspot blogshop template with email invoice last June 2013, it was well received by bloggers and internet users. 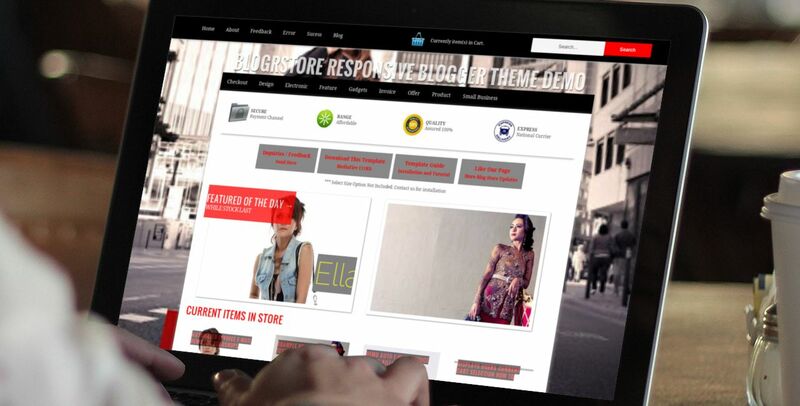 After monitoring these past couple of weeks, we had to put our newest blogger store template addition on hold, BlogrCart Responsive, which was supposed to be due out in August 2013. Regardless of so many tutorial pages including installation customization tips and guides ( and also a video template installation guide with cool soundtrack! ), prepared in our slightly bizarre blog, there are still a small handful " template-developer-wannabe ", customizing according to their needs, but still have no clue in what they are up to! Here's some great tip to help your blogger store template installation, and making sure your invoice email checkout (or any other plug-ins) works like in the DEMO:-. All the blogger template codes has been PROVIDED. It is just mere COPY and PASTE in the right places. Please do not get any ideas yet! Get the feel first before starting out your customizations. When testing your checkout form (clicking the sent mail or any other additional plug-ins), please make sure your customization is accordingly. We left a lot of indicators in template and also the tutorial page. Please proof-read your customization and compare with the original codes in the tutorial. Makes your life much easier! Try to complete every steps in the tutorial first before testing your template installation. The template was designed as a whole, which the codes are much related to one and the other for it to work. Please use the search bar to search for any related tutorials. There are even some tutorials and code sharing via the comments section too! Please ask or submit an inquiry if you are at lost! 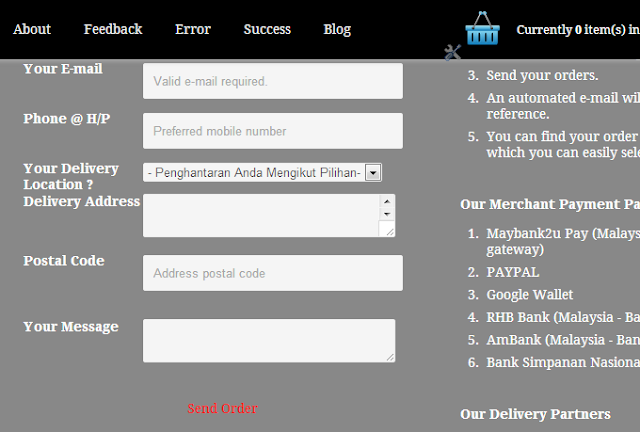 So far we have entertained ALL of our comments and personal mails, WITH NO CHARGE! We even shared codes and customization advise at out Facebook Page. If you are shy to speak, than write! Currently we have dis-connected some of our blogshop checkout test pages due to so many ERRORS recorded / done by these "talented people" . But if you require the link just like provided in the blog DEMO setup, please send us a PM. It's hard enough for us to manage our daily designs routines, website building and graphical works and also keep track on what is coming and going from our servers at the same time. We just want to make the plug-in as FREELY as possible so that you guys can also cash-in just like our client's blogshops right now, via on-line sales. Updated NEW FULL tutorial page at our blog. Improvements on users sent orders, checks valid emails and security. New email plug-in host server with 99.7% downtime. Here's some screen shots on the validation improvements. Screen shot before checkout. Noticed nactive send order button below. Screenshot after checking email validation with active Send Order button. We will keep you posted on more blogger store template updates. 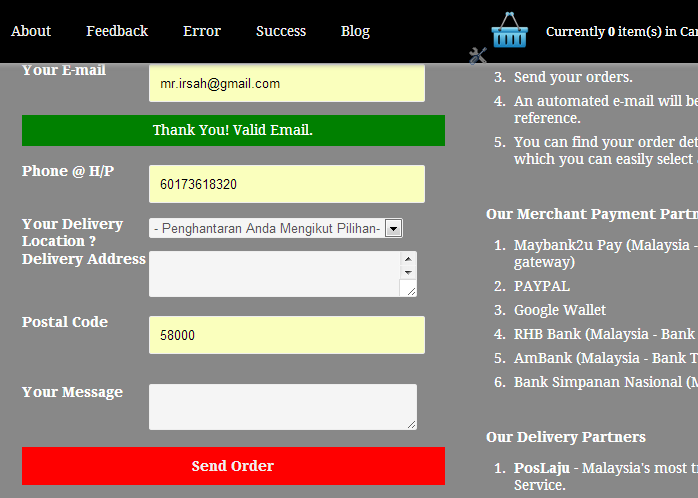 Now, with the new features listed above, your on-line shoppers feels more secured shopping at your blogshop and send orders from shopping cart to email invoice in a flash. It also helps you as blogshop owners, in making sure only validated email is checked and sent via your online email invoice shopping cart checkout page. Just makes it much more easier building and setting up your online store starting from a blog!